It’s a tough time to be an investment banker. Global investment banking revenues stand at $31.4 billion in the first half of the year, according to preliminary figures from Dealogic. That’s down 25% from a year ago, and the lowest first half total since 2010. And really no country was spared. 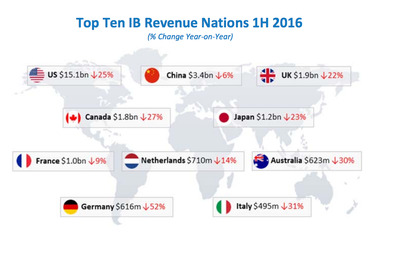 The map below shows the year-on-year change in investment banking revenue by country in the top 10 markets around the world.